Over the past few years, the use of acids in skincare has become super popular and most people have introduced them into their routine in some way. Whether it be in a weekly face mask, daily toner or even in a serum, there are so many ways to incorporate them into beauty regime. Certain acids target specific skin concerns and they’re a powerful way to see quite quick, but also long-term results. For example, Hyaluronic Acid which is one of the more well-known acids used in skincare is a powerful hydrating molecule which when included in skincare can intensely hydrate & strengthen the skin’s barrier for deep, lasting moisture. So I’m very excited to introduce you one of StriVectin’s latest skincare releases, their Advanced Acids Collection. Each product in this line contains their famous patented NIA-114 alongside other active ingredients. NIA-114™ is our patented, optimized form of Niacin/Vitamin B3 clinically proven to strengthen the skin barrier and supercharge the performance of other ingredients for visibly transformed, more youthful skin. This is a serum specifically designed to target skin concerns associated with ageing such as wrinkles and sagging skin. This lightweight milky textured serum will replenish skin making it look plump, feel tight but bouncy to the touch. It is so easy to smooth over clean skin, it instantly hydrates skin and smooths fine lines but it also has incredible long-term results too. Oleic Acid, an Omega-9 fatty acid, replenishes skin’s lipid layer – an essential component of the skin’s barrier. Paired with NIA-114, it improves skin’s resiliency and visibly repairs signs of ageing. This serum doesn’t contain what most people might associate with an acid (like hyaluronic or glycolic) it contains a rich form Omega fatty acids, omega-3 and -9 fatty acid which are incredible for repairing, hydrating and reducing the signs of ageing. They also replenish and support your skins lipids. This can be used alone or under a serum. My skin feels and looks plumper and more supple since using this and my fine lines are smoother and skin is looking more even, especially around my eyes. I like how refreshing this feels on my skin and it certainly feels like it’s repairing my skin and working its magic. Who doesn’t love a skin reset for those days when your skin isn’t playing ball and your makeup just isn’t applying well? This mask is the answer, you only need to apply it for 5 minutes so it is perfect if you’re in a rush and just need glowing, refreshed skin! The Advanced Acid collection pairs our patented NIA-114 molecule with the most potent, skin-transforming acids for maximum efficacy and results. NIA-114™ + Glycolic Acid, the most effective of the alpha-hydroxy acids (AHA), exfoliates dead skin cells from the face to reveal fresh, renewed skin. Paired with NIA-114, this potent yet gentle retexturizer delivers maximum results with minimal irritation. With micro-encapsulated Glycolic Acid for slow-release exfoliation, the supercharged formula restores radiance and dramatically improves texture in just 5 minutes. This gentle exfoliating mask although fast acting is still quite gentle (even for an acid). Glycolic acid, is the most effective of the alpha-hydroxy acids (AHA) & exfoliates dead skin cells from the face to reveal fresh, renewed skin. Paired with NIA-114, this potent yet gentle retexturizer delivers maximum results with minimal irritation. This is so quick and easy to use, I have been loving how smooth and polished my skin feels after using it, it also gives it a healthy glow oh, and my makeup sits so much better too! I love that this mask is a peachy pink in colour and smells really nice too, slightly citrus. It is a really good product to have in your skincare routine and you only need to use it 1-2 times a week which means this 50ml tube will give you last months and help transform dull, textured skin into smooth, youthful skin with a natural healthy glowing. I really like this mask and can’ believe it delivers such visable results in just 5 minutes. This clear, gel-like serum instantly feels hydrating on the skin, it has an almost silky smooth feel to it once smoothed out on to your skin. So I feel Hyaluronic Acid is the most well-known acid when it comes to its use in skincare, it is such a popular ingredient in products aimed at giving intense hydration and lasting moisture. I have used quite a few hyaluronic acid products over the years and think they really help prevent moisture loss and keep skin looking plump which is great for smoothing out fine lines. The Advanced Acid collection pairs our patented NIA-114 molecule with the most potent, skin-transforming acids for maximum efficacy and results. NIA-114 + Hyaluronic Acid, a powerful hydrating molecule, can hold 1,000 times its weight in water. Paired with NIA-114, this dual-action serum visibly plumps skin with moisture to bring dehydrated skin back to life. Chamber 1 contains 6 unique forms of Hyaluronic to visibly plump skin with immediate and sustained hydration. Chamber 2 combines NIA-114 and ceramides to lock in moisture and prevent water loss. If like me you often feel like your skin is feeling dry and your fine lines are a little more visible than usual then this dual response serum will deliver a boost of hyaluronic acid to immediately quench dehydrated skin, but also help give sustained hydration and lock in moisture. Which means your skin will feel and look plump and bring dehydrated skin back to life. So there you have it. 3 Acids which all deliver visible results for specific skin concerns. These new releases from StriVectin have quite a luxurious price tag but if you only bought the one that you’d see the most benefits from then it would be money well spent. I really liked them all, but would 100% repurchase the Mask & the Serum. Dual Response Serum – this serum is so good at delivering hydration and strengthening the skin barrier for plumper, smoother that has visibly less fine lines. Just remember that if you’re using any kind of acid you must use a facial SPF! 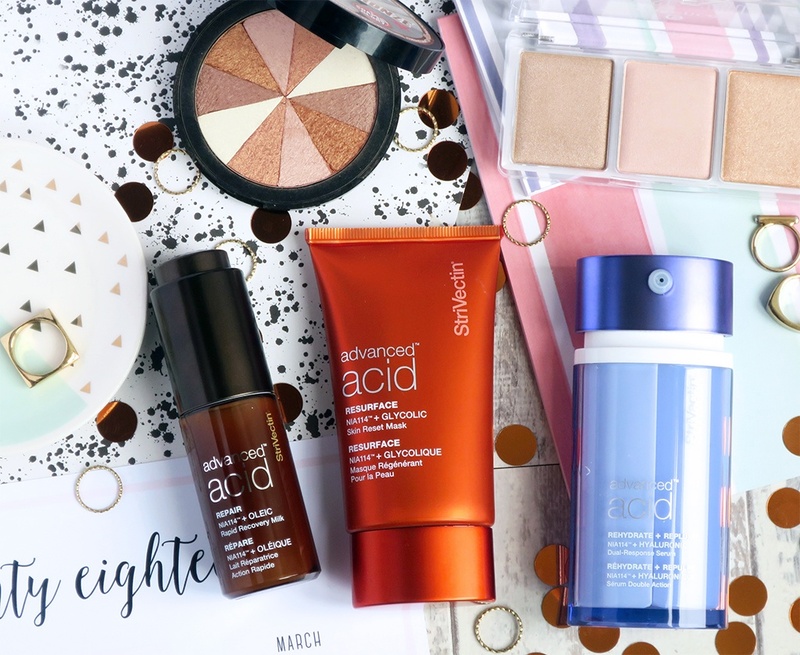 Let me know which Advanced Acid you’re most tempted to add to your skincare regime.